Offer valid 3/01/2019 - 4/30/2019. Available on select tires in stock at participating dealerships. OHTSU, and Kelly tires are excluded. See your Service Advisor for details.©2019 FCA US LLC. All Rights Reserved. Mopar is registered trademark of FCA US LLC. Coupon not valid with any other offer. Must present coupon at time of purchase. Limit one coupon per person. Coupon does not apply to prior purchases. Other restrictions may apply. Void where prohibited. 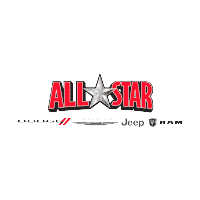 Valid only at All Star Dodge Chrysler Jeep Ram. Offer valid at All Star Dodge Chrysler Jeep Ram. Trucks slightly higher. Must present coupon when order is written up. One coupon per customer per transaction. May not be used on prior transactions. Discount on available Mopar accessories for FCA US LLC vehicles. Maximum value: $200.00. Mopar Accessories are covered by either the 3-Year/36,000-Mile New Vehicle Limited Warranty or the Mopar 24-Month Basic Limited Warranty from the original installation date, whichever is more favorable to the customer. See dealer for complete details and a copy of the warranty. Percentage-off may not be available on installation price. Customer is responsible for local tax and Shop Supplies fee. FCA US LLC vehicles only. Offer expires 12/31/2019. * MOPARGOLD Additional charges may apply. Service contract with synthetic blend motor oil replacement up to 5 qts only per change, oil filter, and 4-wheel tire rotations. Expires 24 months after date of original oil & filter purchase at an FCA US LLC dealership. Offer includes 3 oil changes, 3 tire rotations, and 3 multi-point inspections. Customer is responsible for local tax, shop supplies fee and disposal fees. Valid for most makes and models at participating dealers. Excludes diesel engines. Service advisor has details. Offer expires 12/31/19. ** Additional charges may apply. Service contract with full synthetic motor oil replacement up to 5 qts only per change, oil filter, and 4-wheel tire rotations. Services must be redeemed within two years from purchase date. Offer includes 3 oil changes, 3 tire rotations, and 3 multi-point inspections. Customer is responsible for local tax, shop supplies fee and disposal fees. Valid for most makes and models at participating dealers. Excludes diesel engines. Service advisor has details. Offer expires 12/31/19.